- We don't have competitors. - There are no existing solutions to this problem. You often hear those kinds of statements from young product teams or entrepreneurs. It's often an argument for success. Experienced product teams know the absence of an existing solution is a worrying sign of a non-existent problem. In product development exists an easy filter for problems worth solving. A problem should be urgent, pervasive and customers should be willing to pay for solving it. If a problem does not pass this filter, it might not be worse solving. Solutions might not be obvious or visible at the first sight. If a problem is seriously painful users will always find a way to solve it. Even if partly or very uncomfortable, but some solution would exist. Before we had WhatsApp we had SMS. Before we had SMS we had the telegraph. Before we had Wikipedia we had Oxford's Encyclopedia. Before we had encyclopedia we had our grandpas. Before we had Facebook we had facebook, you know, the real one. And how many problems been solved with Microsoft Excel? Including a problem of boredom in the office. Inability to find the product-market fit is one of the most common reasons for a new product to fail. A solution in search of a problem is one of the most common mistakes done in product development. Innovation is not about creating something radically new. It is about majorly improving something existing, something established. If you cannot find existing solutions to a problem, it might mean you're inventing something radically new, or it might mean the problem is not worth solving. In theory, the process of innovating is rather simple. Understanding a problem space often becomes the key to a successful solution. 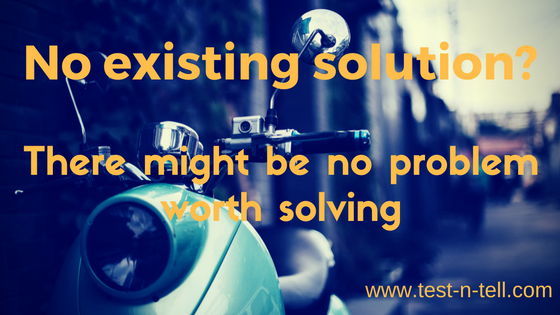 Numerous ways exist to look for a problem and to analyze if the problem is worth solving. Insider's tip: choose problems that interest you, ideally - problems you experience yourself. Having a passion for a problem you're trying to solve is a pre-requisite to a successful solution. If you cannot find existing solutions to a problem be on a high alert. You either haven't found them yet or a problem might not exist. The best way to find existing solutions is asking people who have the problem or/and observing their behavior. Insider's tip: try Jobs-to-be-done framework to find existing solutions to a painful problem. Effort - takes less physical and mental work. Cheaper. Networking effect - other people use it. Gives more value in a combination with other solutions. Value solution provides is another improvement to aim. If you can deliver more value to users without increasing the effort - you're on the right path to winning. Insider's tip: to increase your chances of success aim to be at least two times better than existing solutions. Just having a better solution is not yet enough to succeed with your product. You need to convince people to use your solution. Changing user behavior always difficult. Get yourself familiar with the "Hook" model by Nir Eyal. For people to switch to your solution, it should be much better than their existing one. Much simpler, much more rewarding and switching itself should be easy. If users already invested heavily (time, data, effort) into an existing solution they might be even harder to convince. Insider's tip: check how people acquired their current solution and introduce yours through the same channels.